I love online shopping. I often find that I get more in return from my purchases than shopping in store. I love Sephora mobile deals, online coupons, and earning money back. My favorite way to shop is by using Ebates. 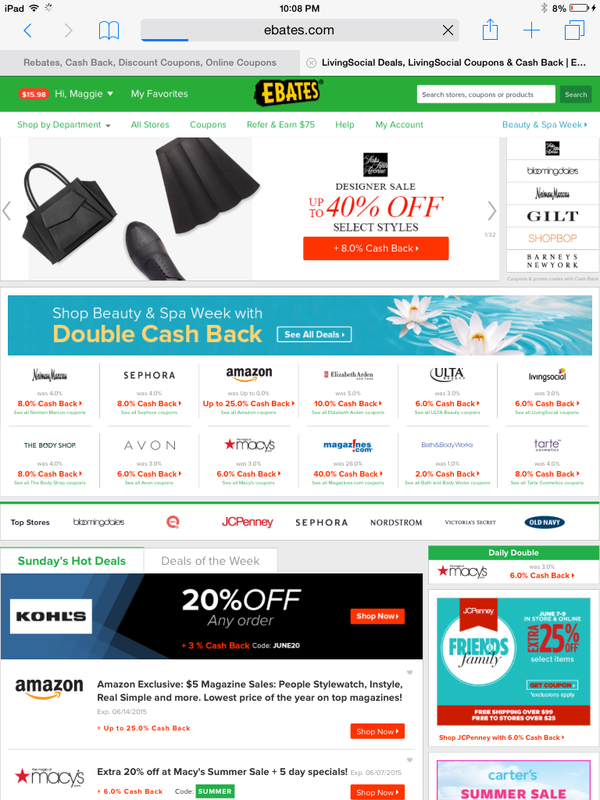 Ebates pays you back a percentage of money from your online shopping trip. It is super easy, and I feel like I am getting paid to shop. There are no weird gimmicks, just simply create a free account, and shop by clicking on the store button of your choice to shop now. After every quarter you’ll get a check or can sign up for it to be put in your paypal account. I love saving money, and Ebates, helps me save! I use Ebates every time I shop online. I highly recommend you sign up and take advantage of all Ebates has to offer. You can sign up easily using my exclusive sign-up link, where you will also choose a gift-card sign-up bonus. Happy Shopping Loves!